A new channel has started in DVB-S Clear: Al Jazeera Mubasher (Qatar) on 10971.00MHz, pol.H SR:27500 FEC:5/6 SID:402 PID:513/660 Arabic. A new channel has started in DVB-S Clear: Al Jazeera Mubasher (Qatar) on 12558.00MHz, pol.V SR:27500 FEC:3/4 SID:9356 PID:250/251 Arabic. Sky Digital: A new channel has started in DVB-S2 VideoGuard: Al Jazeera Mubasher (Qatar) on 12090.00MHz, pol.V SR:29500 FEC:8/9 SID:5802 PID:512[MPEG-4]/640 nar,660 English. New frequency for Al Jazeera Mubasher: 11045.00MHz, pol.H (DVB-S SR:27500 FEC:3/4 SID:9 PID:520/730 Arabic- Clear). New frequency for Al Jazeera Mubasher: 11045.00MHz, pol.H (DVB-S SR:27500 FEC:3/4 SID:2 PID:513/660 Arabic- Clear). New frequency for Al Jazeera Mubasher: 11315.15MHz, pol.V (DVB-S SR:27500 FEC:5/6 SID:9501 PID:1151/1152 Arabic- Clear). New SID for Al Jazeera Mubasher on 4054.00MHz, pol.L FEC:3/4 SR:27500: SID:2 ( PID:513/660 Arabic - Clear). New SID for Al Jazeera Mubasher on 4054.00MHz, pol.L FEC:3/4 SR:27500: SID:9 ( PID:520/730 Arabic - Clear). Al Jazeera Mubasher (Qatar) broadcasts in DVB-S Clear on 11526.13MHz, pol.H SR:27500 FEC:5/6 SID:6010 PID:1210/2210 Arabic. New SID for Al Jazeera Mubasher on 11604.00MHz, pol.H FEC:3/4 SR:27500: SID:10505 ( PID:520/730 Arabic - Clear). New SID for Al Jazeera Mubasher on 12034.00MHz, pol.H FEC:3/4 SR:27500: SID:9 ( PID:520/730 Arabic - Clear). New SID for Al Jazeera Mubasher on 11045.00MHz, pol.H FEC:3/4 SR:27500: SID:2 ( PID:513/660 Arabic - Clear). New SID for Al Jazeera Mubasher on 11045.00MHz, pol.H FEC:3/4 SR:27500: SID:10502 ( PID:513/660 Arabic - Clear). Al Jazeera Mubasher (Qatar) broadcasts in DVB-S Clear on 11045.00MHz, pol.H SR:27500 FEC:3/4 SID:2 PID:513/660 Arabic. New PID for Al Jazeera Mubasher: PID:5509/5510 Arabic SID:5504 (11727.00MHz, pol.H SR:27500 FEC:5/6 - Clear). New frequency for Al Jazeera Mubasher: 10795.90MHz, pol.V (DVB-S SR:27500 FEC:5/6 SID:3616 PID:3636/3637 Arabic- Clear). New frequency for Al Jazeera Mubasher: 10992.00MHz, pol.V (DVB-S SR:27500 FEC:3/4 SID:2 PID:513/660 Arabic- Clear). Al Jazeera Mubasher (Qatar) broadcasts in DVB-S Clear on 11727.00MHz, pol.H SR:27500 FEC:5/6 SID:5504 PID:129/5510 Arabic. A new channel has started in DVB-S Clear: Al Jazeera Mubasher (Qatar) on 11604.00MHz, pol.H SR:27500 FEC:3/4 SID:10502 PID:513/660 Arabic. New PID for Al Jazeera Mubasher: PID:2003/2005 Arabic SID:5702 (10853.44MHz, pol.H SR:27500 FEC:3/4 - Clear). New PID for Al Jazeera Mubasher: PID:129/5510 Arabic SID:5504 (11727.00MHz, pol.H SR:27500 FEC:5/6 - Clear). A new channel has started in DVB-S Clear: Al Jazeera Mubasher (Qatar) on 12669.00MHz, pol.V SR:22500 FEC:5/6 SID:6012 PID:4231/4232 Arabic. New PID for Al Jazeera Mubasher: PID:5509/660 Arabic SID:5504 (11727.00MHz, pol.H SR:27500 FEC:5/6 - Clear). Al Jazeera Mubasher is back on 10853.44MHz, pol.H SR:27500 FEC:3/4 SID:5702 after a break ( PID:2004/2005 Arabic - Clear). New PID for Al Jazeera Mubasher: PID:129/5510 Arabic SID:6204 (11564.49MHz, pol.H SR:27500 FEC:5/6 - Clear). Al Jazeera Mubasher is back on 11564.49MHz, pol.H SR:27500 FEC:5/6 SID:6204 after a break ( PID:5509/5510 Arabic - Clear). New frequency for Al Jazeera Mubasher: 11564.49MHz, pol.H (DVB-S SR:27500 FEC:5/6 SID:6204 PID:5509/5510 Arabic- Clear). New frequency for Al Jazeera Mubasher: 11919.00MHz, pol.H (DVB-S SR:27500 FEC:5/6 SID:2515 PID:2000/2001 Arabic- Clear). Al Jazeera Mubasher is back on 11564.49MHz, pol.H SR:27500 FEC:3/4 SID:6202 after a break ( PID:2004/2005 Arabic - Clear). New frequency for Al Jazeera Mubasher: 11257.61MHz, pol.H (DVB-S SR:27500 FEC:3/4 SID:408 PID:681/682 Arabic- Clear). New frequency for Al Jazeera Mubasher: 11449.41MHz, pol.H (DVB-S SR:27500 FEC:5/6 SID:6315 PID:2000/2001 Arabic- Clear). New frequency for Al Jazeera Mubasher: 11564.49MHz, pol.H (DVB-S SR:27500 FEC:3/4 SID:6202 PID:2004/2005 Arabic- Clear). New SID for Al Jazeera Mubasher on 11564.49MHz, pol.H FEC:3/4 SR:27500: SID:6202 ( PID:2004/2005 Arabic - Clear). New frequency for Al Jazeera Mubasher: 11564.49MHz, pol.H (DVB-S SR:27500 FEC:3/4 SID:6204 PID:5509/5510 Arabic- Clear). A new channel has started in DVB-S Clear: Al Jazeera Mubasher (Qatar) on 4054.00MHz, pol.L SR:27500 FEC:3/4 SID:2 PID:513/660 Arabic. Al Jazeera Mubasher switched to Eutelsat 7 West A satellite at 10853.00MHz, pol.H (DVB-S , 10853.00MHz, pol.H SR:27500 FEC:3/4 PID:2004/2005 Arabic). Al Jazeera Mubasher switched to Eutelsat 7 West A satellite at 11034.00MHz, pol.V (DVB-S , 11034.00MHz, pol.V SR:27500 FEC:3/4 PID:2004/2005 Arabic). Al Jazeera Mubasher switched to Eutelsat 7 West A satellite at 10930.00MHz, pol.H (DVB-S , 10930.00MHz, pol.H SR:27500 FEC:3/4 PID:2000/2001 Arabic). New FEC for Al Jazeera Mubasher on 11727.00MHz, pol.H: FEC:5/6 ( SR:27500 SID:5504 PID:5509/5510 Arabic - Clear). A new channel has started in DVB-S Clear: Al Jazeera Mubasher (Qatar) on 11178.00MHz, pol.H SR:27500 FEC:3/4 SID:2 PID:513/660 Arabic. New frequency for Al Jazeera Mubasher: 10809.00MHz, pol.V (DVB-S SR:27500 FEC:3/4 SID:2 PID:513/660 Arabic- Clear). Al Jazeera Mubasher (Qatar) broadcasts in DVB-S Clear on 12476.00MHz, pol.H SR:27500 FEC:3/4 SID:3708 PID:3722/3723 Arabic. A new channel has started in DVB-S Clear: Al Jazeera Mubasher (Qatar) on 4136.00MHz, pol.L SR:27500 FEC:3/4 SID:2 PID:513/660 Arabic. New frequency for Al Jazeera Mubasher: 12399.00MHz, pol.V (DVB-S SR:27500 FEC:3/4 SID:805 PID:351/352 Arabic- Clear). New frequency for Al Jazeera Mubasher: 12476.00MHz, pol.H (DVB-S SR:27500 FEC:3/4 SID:3708 PID:3722/3723 Arabic- Clear). New frequency for Al Jazeera Mubasher: 12399.00MHz, pol.V (DVB-S SR:27500 FEC:3/4 SID:803 PID:331/332 Arabic- Clear). 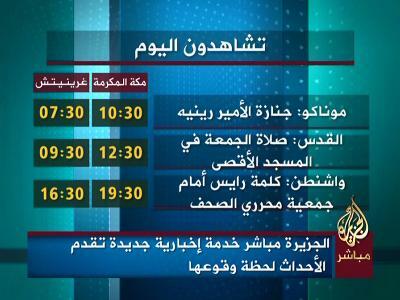 New frequency for Al Jazeera Mubasher: 10930.00MHz, pol.H (DVB-S SR:27500 FEC:3/4 SID:3502 PID:2000/2001 Arabic- Clear). New frequency for Al Jazeera Mubasher: 10949.00MHz, pol.V (DVB-S SR:27500 FEC:3/4 SID:6021 PID:1221/2221 Arabic- Clear). A new channel has started in DVB-S Clear: Al Jazeera Mubasher (Qatar) on 11727.00MHz, pol.H SR:27500 FEC:3/4 SID:5504 PID:5509/5510 Arabic. Al Jazeera Mubasher switched to Atlantic Bird 4A satellite at 10719.00MHz, pol.V (DVB-S , 10719.00MHz, pol.V SR:27500 FEC:3/4 PID:513/660 Arabic). Al Jazeera Mubasher (Qatar) broadcasts in DVB-S Clear on 10873.00MHz, pol.V SR:27500 FEC:3/4 SID:9200 PID:300/301 Arabic. New frequency for Al Jazeera Mubasher: 10892.00MHz, pol.H (DVB-S SR:27500 FEC:3/4 SID:16 PID:534/1302 Arabic- Clear). New frequency for Al Jazeera Mubasher: 10873.00MHz, pol.V (DVB-S SR:27500 FEC:3/4 SID:9002 PID:760/769 Arabic- Clear). New frequency for Al Jazeera Mubasher: 4120.00MHz, pol.V (DVB-S SR:27500 FEC:3/4 SID:2 PID:513/660 Arabic- Clear). Al Jazeera Mubasher (Qatar) broadcasts in DVB-S Clear on 10719.00MHz, pol.V SR:27500 FEC:3/4 SID:3910 PID:513/660 Arabic. New frequency for Al Jazeera Mubasher: 12034.00MHz, pol.H (DVB-S SR:27500 FEC:3/4 SID:2 PID:513/660 Arabic- Clear). New SID for Al Jazeera Mubasher on 12284.00MHz, pol.V FEC:3/4 SR:27500: SID:2707 ( PID:518/710 Arabic - Clear). A new channel has started in DVB-S Clear: Al Jazeera Mubasher (Qatar) on 12111.00MHz, pol.V SR:27500 FEC:3/4 SID:706 PID:250/251 Arabic. New SID for Al Jazeera Mubasher on 12284.00MHz, pol.V FEC:3/4 SR:27500: SID:2705 ( PID:516/690 Arabic - Clear). A new channel has started in DVB-S Clear: Al Jazeera Mubasher (Qatar) on 12284.00MHz, pol.V SR:27500 FEC:3/4 SID:2703 PID:514/670 Arabic.